Udaipur is the gold standard for pristine white marble palaces. 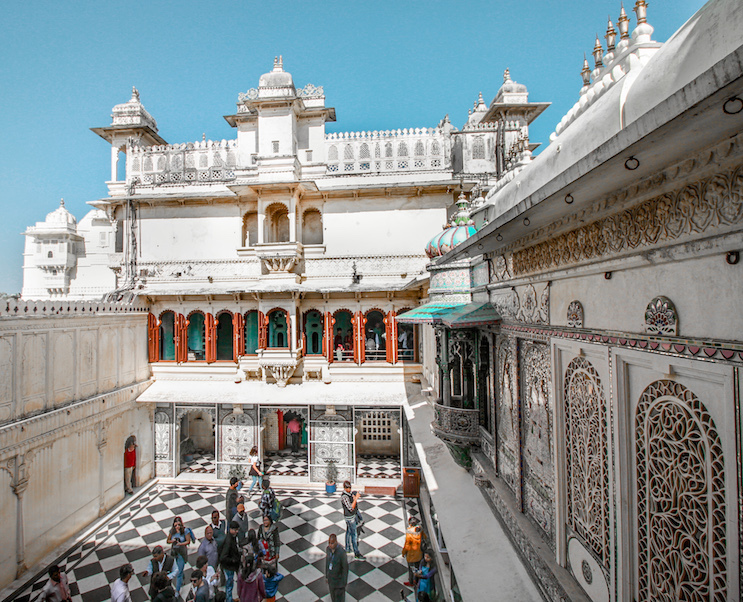 The majestic structures, the architectural details, and the quirkiness of the quarters inside make the City Palace Udaipur a sight to behold. No wonder, the palace is jam-packed with tourists round the year. City Palace Udaipur was our first stop in the city. We were told by the locals that the best time to visit the palace is early morning. Right when the gates open. At first, we didn’t know what the fuss was about, but one foot inside the palace and our eyes were wide open in wonder. It took 400 years and many rulers of the Mewar dynasty to build this palace. Its construction first began in the year 1553. Maharana Udai Singh 2 of the Rajput clan ordered the construction of this palace after shifting his capital from Chittaur. Flamboyance is a big part of the architecture which was inspired by both Mughal and Rajasthani style. Now, this is what a palace should be like. The quintessential princess dream. The Royals sure must have had a beautiful time walking through these courtyards on a sunny afternoon. It’s no wonder they decided to keep a big chunk of the palace for their own stay even to this date. #2 The world famous Blue Room of City Palace Udaipur which will make you want to paint your room blue. At least I wanted to paint mine blue until the boy put some sense into me. But can you blame me, after visiting the beautiful blue city Jodhpur, and now this, who wouldn’t want to. #3 The detailing on the Jharokhas, oh so intricate ! I might have spent the maximum time ogling at these beautiful jharokhas. In the old days, these jharokhas were used by royal princesses to take a peek at the happenings outside their four walls. If you are visiting the city palace Udaipur, I would highly recommend attending the light and sound show in the evening. The palace is less crowded, and you can really soak in the beauty of the glowing architecture whilst getting a history lesson no less. What do the light and sound show at City Palace Udaipur cost? INR 500-700 per person. The timings are usually 7-8 pm. It would be better if you buy the tickets in advance as the show runs full house pretty much every day every season. Bonus: You can also get the tickets for Jag Mandir and boat ride from the same ticket booth. I might have more than a few pictures clicked in this place. It’s not every day that one gets to see beautiful backdrops and this one I can assure you was a stunner. You can’t really tell how high up the floors really go before looking out of one of the windows. People look super tiny, and you get an amazing view of the old city. One of the most opulent rooms at City Palace Udaipur is the King’s quarters. You can view it only from the outside. But what is great is that they have maintained the original look and feel of the room. It gives great insights on how the royals lived in the ancient times. #8 + They also have a beautiful backyard open to the public. That’s the museum view behind me. At this point, you would realize that the palace compound is quite vast. It does take the better half of the day to go through each corner of the palace. What is the best time to visit City Palace Udaipur? Best time to visit City Palace Udaipur would be the non-summer months. However, do note that peak seasons calls for major crowd pull in this city. Both national and international tourists come round the year to check out these gorgeous palaces. September, October are ideal for visiting Udaipur.